"The practice of evidence-based public health (EBPH) is an integration of science-based interventions with community preferences for improving population health." [scroll to page 2] "There is a growing body of literature on measuring the impact and effectiveness of public health policies and environmental strategies. In an analysis of 5 systematic reviews of 52 public health laws, 27 of the laws were found effective, 23 did not have sufficient evidence, 1 was harmful, and 1 was ineffective at promoting healthy behavior." Find evidence-based information and resources for the Healthy People 2020 Topic Areas. Each of the selected evidence-based resources has been rated and classified according to a set of selection criteria based, in part, on publication status, publication type, and number of studies. The Cochrane Reviews in the Cochrane Database of Systematic Reviews are prepared by authors who register titles with one of 52 Cochrane Review Groups. Each Cochrane Review Group focuses on a specific topic area and is led by a Coordinating Editor(s) and an editorial team including a Managing Editor and an Information Specialist. The Cochrane Review Groups provide authors with methodological and editorial support to prepare Cochrane Reviews, and manage the editorial process, including peer review. These systematic reviews differ from other types of review in that they adhere to a strict design in order to make them more comprehensive, minimizing the chance of bias, and ensuring reliability. Rather than reflecting the views of the authors, or being based on a partial selection of the literature, (as is the case with many articles and reviews that are not explicitly systematic), they contain all known references to trials on a particular intervention and a comprehensive summary of the available evidence. The purpose of the search strategies presented here is to help inform discussions on or relating to comparative effectiveness by providing retrieval of a full-range of studies on the efficacy-effectiveness-effectiveness in the "real world" continuum. This website provides free online access to evidence-based public health (EBPH) resources, knowledge domains of public health, and public health journals and databases. From the Advanced Search screen, use the condition and intervention fields. The system uses automatic term matching and MeSH. Use the Search Detail tab to see search results and modify search. In Search Help, read about "How to Read a Study". This database provides easy access to a number of resources selected for their relevance to decision-making on public health, health care and health-system policy in the WHO European Region. NHS Evidence is an online portal provided by NICE, which gives fast access to a wealth of quality information and best practice. The EBBP.org project creates training resources to help bridge the gap between behavioral health research and practice. Trickett EJ, Beehler S, Deutsch C, Green LW, Hawe P, McLeroy K, et al. Advancing the Science of Community-Level Interventions. Am.J.Public Health 2011 AUG;101(8):1410-1419. Green LW, Kreuter MW. Evidence Hierarchies Versus Synergistic Interventions. Am.J.Public Health 2010 10;100(10):1824-1825. Green LW. Public health asks of systems science: to advance our evidence-based practice, can you help us get more practice-based evidence?Am.J.Public Health 2006 Mar;96(3):406-409. Greenhalgh, T. (1997). How to read a paper. getting your bearings (deciding what the paper is about). BMJ (Clinical Research Ed. ), 315(7102), 243-246. Jacobs JA, Jones E, Gabella BA, Spring B, Brownson RC. 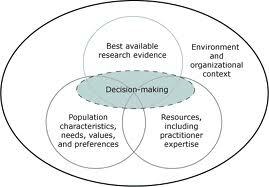 Tools for implementing an evidence-based approach in public health practice. Prev.Chronic Dis. 2012;9:E116. Gillespie KN. Evidence-based public health benefits communities. Health Prog. 2008 Mar-Apr;89(2):6-7. Brownson RC, Fielding JE, Maylahn CM. Evidence-based public health: a fundamental concept for public health practice. Annu.Rev.Public Health 2009 Apr 29;30:175-201. Narrative reviews tend to be mainly descriptive, do not involve a systematic search of the literature, and thereby often focus on a subset of studies in an area chosen based on availability or author selection. Thus narrative reviews while informative, can often include an element of selection bias. They can also be confusing at times, particularly if similar studies have diverging results and conclusions. A seminal article which reviews different types of scoping studies. Three chapters are: What is a Scoping Study?, Methodological Framework, and Discussion and Conclusion. Makes recommendations to clarify and enhance the methodology in each Arksey and O'Malley step. Has a good table of definitions and purposes of scoping studies. This wiki has a lot of info in one place on scoping reviews. Content is available under a Creative Commons Licence. Discusses the development of the title and research question in the format: PCC (Population, Concept and Context) and the development of sub-questions. Bazzano, A. N., Martin, J., Hicks, E., Faughnan, M., & Murphy, L. (2017). Human-centred design in global health: A scoping review of applications and contexts. PloS One, 12(11), e0186744. 10.1371/journal.pone.0186744 [doi]. Excellent discussion about methods and lessons learned in conducting scoping reviews, especially about searching for concepts with a variety of names, and searching terms in different databases. A must-read. Primary clinical trial registry recognised by WHO and ICMJE that accepts all clinical research studies (whether proposed, ongoing or completed), providing content validation and curation and the unique identification number necessary for publication. All study records in the database are freely accessible and searchable. The Clinical Trials Search Portal provides access to a central database containing the trial registration data sets provided by the registries listed on the right.